There is no question that more people are getting total knee replacements than ever before. However, unlike with an organ transplant, when a patient undergoes the procedure, they are not getting a joint from a donor, but rather having an artificial knee implanted. This artificial knee has been manufactured by one of a few medical device companies. When a patient goes to their doctor and is told they will need to have a total knee replacement, the surgeon will typically tell a patient what type of device he or she would like to use and get an informed consent for the use of that particular type or model or artificial knee. In the past, doctors just stated their preference and patients went along with that. Today, doctors are more commonly explaining the different types of artificial knees and having the patient make a choice. One of the possible reasons for this is because of the problems they have seen with defectively-designed artificial knees. A recent news article from Tulsa World involves an orthopedic surgeon explaining to readers what their different options are and the risks and benefits associated with each of these options. One of the options discussed is a metal-on-metal total knee replacement device. As the doctor discussed, all metal implant devices were made to be more durable and last longer than other implants, but they have been shown to break apart and release small shards of metal. These metal shards can then cause a serious medical condition known as metalosis. These metal shards can also become embedded in a patient’s surrounding tissue causing substantial pain and suffering. In addition to metalosis and other types of pain and suffering, you may need to have another surgery to have the defective joint replacement, and this results in more time missed from work (lost wages), additional pain and suffering, more medical costs, and an overall discomfort in your life. If you have been told you need a second or subsequent surgery on your knee because a medical device has failed, you should contact an experienced Boston knee replacement injury attorney to see if you have a valid claim to a full and appropriate financial recovery. 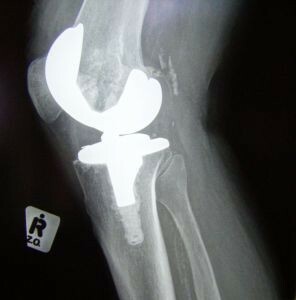 Another common type of artificial knee implant is a polyethylene device. This polymer-based artificial knee is more prone to wear and tear, as it is made of plastic instead of metal, but there is not the associated risk of metal shards being released into a patient’s blood stream. However, these devices can emit tiny flecks of plastic that can cause a response from the patient’s immune system. When these immune cells attack the plastic, it can weaken the bone surrounding the artificial implant. The final type of knee replacement device commonly used is a ceramic-on-ceramic knee replacement artificial knee. Ceramic is hard like metal and smooth like a polymer, but does not appear to lead to any breakdown. However, there is still a lot of research to be done to see if they are safe for total knee replacement patients over the long run.